New York, N.Y. : Riverhead books, 2013. So begins Khaled Hosseini’s new novel, his first in six years but, somehow, it seems so much longer than that. Also, it’s not too soon to get out the tissues because this book induces one crying jag after another. The fable that Saboor tells his two children, Pari and Abdullah, in Afghanistan, sets the stage for a multigenerational saga that spans more than half a century, and crosses three continents. And honestly, who better than Hosseini, to prove to us once again the resilience of family and love and honor and betrayal and respect for one another? He does it so well and so ably with storytelling skills not to be rivaled. The book almost reads like a series of interconnected short stories which really plays to Hosseini’s skill as a storyteller. And it’s hard to summarize without giving away too much. So let me just say that Pari and Abdullah are there in 1952, with the telling of the fable and they continue to be important characters in the story throughout the book. But Hosseini also extends the connections to brothers, sisters, cousins and caretakers, and expands his tale from Afghanistan to France, Greece and the U.S. as his characters move on and abandon their homeland. It’s quite striking and very powerful. And he fills each location with strong, vibrant characters: selfless, Nabi, uncle to Pari and Abdullah, who brokers a deal that impacts two families for years to come and never gets over his guilt; the young son of an Afghan warlord, who doesn’t really understand his father’s affairs, but gets a hasty education from Abdullah’s adolescent cousin, whose future is in the warlord’s hands; a young Greek girl whose face is chewed off by a dog and who confronts shocked observers bravely and with great audacity, daring acquaintances to accept her; a young California woman, who accepts her Afghan parents left-over allegiance to their Muslim faith, while giving up her bright future; and a Greek plastic surgeon who gives up everything to care for the mutilated children in Kabul. Hosseini weaves their stories together to produce a tapestry that displays all the hopes and dreams of the characters over the course of half a century. So begins Hosseini’s latest, And the Mountains Echoed – with Afghan father, Saboor, telling his young children a story. Saboor’s son, Abdullah, and his daughter, Pari, are the novel’s central characters, siblings who share an uncommonly beautiful bond. The story Saboor tells them is about a mythical Afghan ogre, a div, which separates children from their families – a fate which, according to the tale, might not be so horrible as first imagined. Unfortunately for Abdullah and Pari, such a separation will shortly become their reality. Going forward from this point, the novel spans some sixty years, 1949-2010, moving ever outward to encompass a huge cast of characters, whose lives and loves we follow around the globe, from Kabul to Paris to San Francisco to the Greek island of Tinos. All of the characters’ stories, of course, across generations and continents, will come back to Abdullah and Pari. I loved The Kite Runner. I don't think I ever finished A Thousand Splendid Suns (there was nothing wrong with it; it just wasn't clicking for me at the particular time). I like Hosseini's writing, so I was really looking forward to sinking my teeth into this one. And when I got started, everything was working for me: a story told to children by their father, the siblings having an extremely tight bond to each other, the contrast between their village life and a visit to Kabul. Then the siblings, Pari and Abdullah, are separated from each other and also from the reader because the next section centers around their uncle, Nabi. I was still on board here, and then we made a leap to another character. And near the end of this section, as I put the book down for the evening, I thought, "why do I feel so bored right now?" and I realized it was because I did not care about these people. Or the previous people. Or Pari's life as a young adult, honestly. It felt to me like just a huge placeholder until we could get back to the core of the story, Pari and Abdullah. Would they find each other? Would a reunion fix everything? Most of the intervening sections were interesting enough to deserve having the stories they contained told, but I didn't want to read these stories in the middle of this book. I didn't want to dance around on the periphery of Pari's and Abdullah's lives. So my verdict is: the writing - wonderful. The beginning and the end - A+. The middle sections - uneven. I'm probably being extra-harsh in giving the book 2 1/2 stars, but I guess I'm probably subtracting half from "it was okay" just because I wanted it to be better than it was. But none of the above is really what brought the tears to my eyes. We love someone, and even if we try our hardest to make the best choices, even if we sacrifice our own personal needs, still one can be left with such emptiness. Sometimes that emptiness simply cannot be filled. Sometimes we try our best, but so much is misunderstood. Life is damn messy. There can be a wonderful blessing in forgetting. I know that sounds crazy, but it is true. The book explains this better than I have. "And the Mountains Echoed" is not nearly as emotionally satisfying as Hosseni's two previous novels. Of the three novels, this one is the most "literary" and ambitious in that it involves multiple characters that are sometimes only remotely connected to the two people at the core of the author's story - and is largely told in flashbacks. These two, a brother and sister in a remote Afghan village, are separated in a surprising way that forever changes their lives and those of their descendants. Surprisingly, however, after the children are split apart, Hosseini spends as much time exploring the lives of those who cross their paths as he does on his "main characters." It is not at first always clear who some of these people are and, frankly, some of their stories are rather boring and do not add much to the mix. The result is that I, as an admirer of the author's two previous novels, found myself struggling to get through the last one-third or so of "And the Mountains Echoed." There is no doubt that Hosseini can write lyrically and compellingly and that he can bring the reader emotionally into a story. I have some doubt of his ability to manage a large number of characters and still produce the same emotional impact. The first part of [And the Mountains Echoed] is completely amazing. Reading the first couple of chapters, I thought that it could be even better than [The Kite Runner]. The story begins with a story, told by a father to his young son and daughter at bedtime. These children are exceptionally close, the older brother, Abdullah, has been like a mother to his sister. The story foreshadows what is about to happen to them, but only the father knows this. In the morning, they set off on a journey on which the son, the older brother is not invited. He is persistent and is finally allowed to come along. At the end of the journey, he finds that his sister is to be given to a wealthy couple in Kabul and they are separated. And then, suddenly, the story takes off on a tangent to someone else. And then another tangent to someone else. We only hear in passing of Abdullah and have no idea how Abdullah deals with the loss of his sister until the very end of the book when we find out that it has created in him a fear of separation that will, in turn, effect the life of his only daughter, and then he gets Alzheimer's and is unable to enjoy the long-awaited reunion with his sister. Unfortunately, by this time, I had completely given up hope of ever knowing Abdullah's story and could barely register an emotional response. Perhaps the intent was to mirror the experience of the characters in that they knew nothing of each other for decades. Even so, it didn't work for me. All the intervening stories, Markos and Thalia, Iqbal and his son, the two cousins who visit Afghanistan together, Pari's life in France, seemed disconnected and mostly frustrating to the point that I struggled a bit to finish the book. A father tells his children the story of a div, a creature who forces parents to choose one child to give away so that they could save the rest of their children from death. It feels like a fable, but its dark edges have a ring of truth. And then it is the autumn of 1952 and four year old Pari her older brother, Abdullah, make a journey across the desert with their father to Kabul. Neither one understands the implications of this journey, but it will forever change their lives. From this one moment in time, Khaled Hosseini’s newest novel spirals out through the decades, taking readers to Paris, San Francisco and the Greek island of Tinos. But it all begins in Kabul, under the searing Afghanistan sun. And the Mountains Echoed tells the lives of many characters – Abdullah and Pari, their Uncle Nabi, Nila Wahdati who is married too young to a wealthy man, cousins Idris and Timur who could not be more different, the deformed Thalia and the mother who abandons her, a Greek doctor who spends his life helping Afganis, and many more. The novel is, in essence, a series of linked stories about these characters – all of whom are strong enough to carry an entire book had Hosseini wished to do that. The reader does not always see the connections between the characters immediately, but as their distinct voices ring out across the pages, it becomes clear how their lives have intersected with those of the other characters. The effect is powerful. Khaled Hosseini is a magnificent storyteller. His prose is captivating, deeply moving, and insightful. But it is his characters which elevate his novels. His latest effort after six years of work, is another example of the range of Hosseini’s talent. I did not want this book to end. I savored the pages. I found myself completely engaged in the lives of the many characters. I was transported through time and across thousands of miles. And the Mountains Echoed is a novel about family, loss, identity, and connection with others. Hosseini explores the idea that a simple choice will echo across time and have deep ramifications for generations to come. At the moment I heard that this book was to be published, I began to anticipate it. I longed to read it. And it did not disappoint. If you have not read a Hosseini novel yet, I urge you to pick up a copy of this one when it goes on sale later this month. Readers who love historical fiction, multi-generational family sagas and character-driven novels of the highest caliber will not want to miss And the Mountains Echoed. 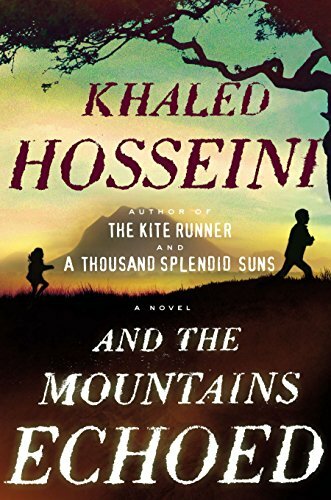 I think I am one of the few readers on the planet who has not read Khaled Hosseini's previous works - The Kite Runner and A Thousand Splendid Suns. With the release of his third novel, And The Mountains Echoed, I thought it was time to sample this best selling author. And the Mountains Echoed opens in 1952 with an Afghani father telling his son and daughter a fable - the story of a parent's love for his child, fighting off a div (ogre) who claims children from their village. The father loses one of his children to the div, but cannot stop thinking about him. After many years, the father goes to the div's palace to reclaim his son, but the child is now living a life of privilege and happiness. The div offers the father the chance to reclaim his child, but does he really want to take him back to a life of poverty and hardship? "You are a cruel beast, Baba Ayub said. When you have lived as long as I have, the div replied, you find that cruelty and benevolence are but shades of the same color." And that fable sets the stage for the rest of the book. In the next chapter, the storytelling father sells his daughter to a wealthy family, separating his son and daughter. They have shared an incredible bond in their short lives. Is that bond every truly broken? Can the echoes of their love follow them and stay with them? Hosseini takes us on a wide, sweeping, encompassing journey touching on all who play a part or touch the lives of the two children - from childhood to old age. As it's base the story is about the two children, but Hosseini builds wonderfully rich tales around many of the other characters. In that sense, the book has many lead characters, spanning countries and time lines. (I have to say, one of my personal favourites was Odelia, one character's Greek mother. Her sense of right and purpose was inspiring.) At least one character in And The Mountains Echoed will touch or stand out for every reader. Not every character is sympathetic, but all elicit a reaction. Khaled Hosseini writes a good story, the style of this book though did not suit my style of reading. As always Hosseini has a way with words and what I did read was enjoyable and would recommend this book to his followers. Khaled takes us once again to Afghanistan. We learn about the Afghani culture in Khaled’s books. The book begins with an Afghani fable. We are dropped into the life of a young country girl Pari. She has a deep love for her brother Abdullah. She is torn from him and her family and becomes the daughter of a woman that her uncle works for. She doesn’t remember quite what happened when she gets older, but she senses that she was adopted. The book goes on to tell us of Kabul and of characters loosely woven into the lives of Pari and Abdullah and the family that she became a part of. The end was the best part for me, when the story came around full circle. Abdullah and Pari are reunited, but sadly Abdullah has Alzheimer’s and doesn’t remember her or the past. I think that this was an emotional tale of the harsh realities that life sometimes presents. The ugly side of life that sometimes must be dealt with and how people handle it. There are some heartbreaking scenes and some little pearls of hope scattered through out. There is a contrast of the people who have things and those that have not. And The Mountains Echoed starts in 1952 with a peasant Afghani family selling their 3 year old daughter Pari to a wealthy Kabul couple. The story ends in 2010 with Pari’s bittersweet (mostly bitter) reunion with her beloved but long forgotten brother Abdullah. The story unfolds through characters whose lives have in some way been touched by the consequences of this action. Among them, Pari herself; Pari’s step-Uncle Nabi , the wealthy couple’s chauffeur/cook; Pari’s adoptive mother Nila, an unconventional and slightly neurotic Muslim woman; Dr. Markos, a Greek plastic surgeon working for an international aid agency to restore disfigured children in post-Taliban Afghanistan; and other richly drawn people. I found Hosseini’s style of skipping from timeframe to timeframe distracting. One paragraph might end in 1968 and the next resume in 2002, without warning. Also, grasping the reason for the deep background given about each character -- without any hint as to the character’s importance to the unfolding of events -- seemed tiresome and a little confusing. Khaled Hosseini’s first two novels, The Kite Runner and A Thousand Splendid Suns were two of the finest books I have ever read. And while his most recent effort, And the Mountains Echoed, is a fine piece of work, it doesn’t rise to the level of his first two novels. Hosseini is a magnificent story teller, as demonstrated by his first two novels, and his skill can easily be seen in his most recent work as well. However, the structure of the book, jumping back and forth in both time and story thread, result in a disjointed reading experience and detract from the overall enjoyment of the work. As in his previous novels, much of the action centers on Afghanistan, from the late 1940s to the present day. Unlike Kite Runner and A Thousand Splendid Suns, however, large parts of the story take place in locales as diverse as Paris, California and Greece. I'm going to steal from another reviewer's title as it sums up my feelings exactly: "Brilliant beginning; waning ending." I couldn't put the book down when I started. The depictions of life in rural Afghanistan were so well drawn especially the character of the young boy who so lovingly takes care of his little sister. The life of a woman who takes care of her disabled sister is heartbreaking. The "selling" of the young girl to a wealthy woman and the person of her husband are so well portrayed. The relationship of that husband with his chauffeur/cook is also believable and touching. Then something happens. The skipping around between time periods starts to become a bit hard to follow. Characters begin to appear that don't seem to quite fit the picture. And there is one chapter set in Greece where a young boy and his disfigured friend are taking a picture with a "homemade" camera which totally threw me. I honestly thought perhaps there was an error in the download - did I miss something? Hosseini has kept us waiting six years for another of his masterpieces and though the wait was long, it was worth it. He does not disappoint with his newest novel...really more a work of great literature. If you read his other books, THE KITE RUNNER and A THOUSAND SPLENDID SUNS, this book will rank right up at the top with the other two. If you are new to his writing, this book will cause you to put all your other books aside so you can read his others. He truly is a master at storytelling. This book includes stories upon stories. Starting with a fable and then telling the stories of families over many generations and then by the end intertwining all of the individual stories into one. This is how the title of the book is worked in. I expected to find the title actually in the story, but the title actually explains the book. As you travel through each of the individual stories, parts of them "echo" into the next. At least, that is how I interpreted the title. That is what makes this book so uniquely beautiful. When talking with a friend about this book, I described it as heartbreaking and yet, wonderful. Each of the stories were full of agony, despair, disappointment, suffering, or heartache, but they were also full of hope, happiness, and surrounded by a love and devotion for family. That devotion is what kept you turning the pages. The love of family is really what is at the heart of this novel. Brothers and sisters, cousins, and even friends who are all the family that the person has. The decisions, compromises and judgments rendered in each of their lives and the ramifications for future generations were mind-boggling. How Hosseini can create these stories is amazing and I am so glad he has shared his talent with us. The stories are set in Afghanistan, Greece, France, and the US. There are stories of extreme wealth and severe poverty. The stories of poverty, especially in Afghanistan, were such a jolt to my easy life here in America. It was another humbling reminder (after going through a weekend of a "boil order" in our town) that there is truly so much suffering in the world that most of us have no grasp of. I truly am appreciating our community and our freedoms after reading this novel. I could gush on and on about this novel, but I just don't want to give any more of it away. The main tip I would give you for this novel is to try to read it in a short period of time. I don't think that will be an issue because you will want to continue reading it. But, even after just a 2 day break from the book, it was difficult for me to keep all the stories and characters straightened out. The flow of the novel was a bit difficult at times because the flow of one story would stop and transfer to another story without much warning. There were several times in the novel where I had to stop and reread a page or two to get my mind on the right people. Keeping a character list might be helpful as you read along. This was our book club choice for the month and it makes for an excellent discussion. The questions supplied on the publisher's website, although deep, were a good jump start to the numerous topics. Loss, separation, family, and forgiveness are just a few of the topics you could start with. There were so many wonderful descriptions and ways to tell a story in this book. I could have practically highlighted something on every single page. I will give you just one example that when I read it, I nodded and said, "Exactly!". Hosseini is a very talented story teller, and he tells a good story in this book. But I think he is trying to do more here - there are multiple, related stories happening; multiple themes recurring - of separation, aging, parenting; and there are even multiple styles of story telling - omniscient narrator, first person narratives by multiple characters, a long letter with much narrative information, and an extended magazine interview. In the end, I'm not certain that it all works as well as might have been intended. Some of the inter-related sub plots are developed too much to be mere asides, but not enough to tie up the loose ends of the characters involved. Some of the array of story telling techniques seem to be pointless or distracting. But, I didn't want, at any time, to put the book down. He is a great story teller, and I wanted to enjoy all of the story that he was telling me. So, a good book, but one that could have been great.